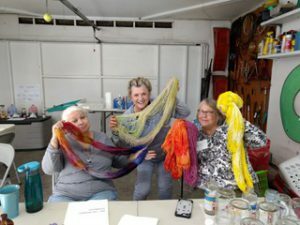 Knitting at a MTM Workshop. Guild members share their specific areas of expertise with other members in these intimate workshops. Enthusiastic teachers bring you new techniques, special projects and knitting know-how. MTM workshops are open to all members as instructors, hosts and students. Non-refundable workshop fees are paid at the Guild’s MTM Table and go directly to the instructor. (Instructors: you pick the class length, date, and location.) 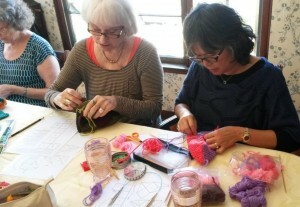 MTM workshops take place all over San Diego county in members’ homes, not necessarily at the instructor’s home. Hosts attend for free! Consider hosting or teaching and get even more out of your Guild membership. 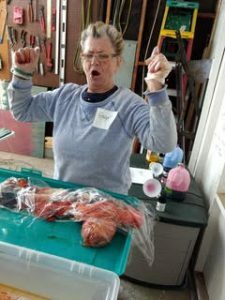 Teach a workshop! Contact MTM Coordinators Thea Lazarevic and Maria Hoham at MTMWorkshops@SanDiegoKnitters.com and share your enthusiasm with Guild members! Download a MTM Teacher Form to get started! 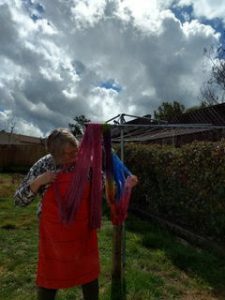 Host a Workshop! Volunteer your home as a MTM workshop classroom. You only need a table and chairs to get started. The teacher can focus on her students and class materials. Hosts get to take the MTM workshop free of charge! We are searching for more host homes in various parts of the county. Contact MTM Coordinators Thea and Maria is you would like to host a MTM! Click to see a list of Guild members who have volunteered to host.